Rate this Article ... and this is coming from someone who has years of experience hustling it out on Farmville and Farmville 2, and is currently playing both Taonga and Funky Bay on the side. Although farm games are intentionally designed to provide an after-work relief (of sorts) to people working a stressful life, sometimes, you just want to play a game to the best of your capacity... and to “win” at it! Now, I know that you can’t possibly “win” in a farm game and that the title might be a bit misleading since because mainly there is no such thing as winning in a farm game. However, it isn’t at all wrong of you to want to become the best gosh-darn virtual farmer there is. It’s just that you may take years simply to figure out the best way to succeed at a farm game just to be attracted to another farm game and having to start over. So, instead of giving you tips and hints on how to “win” in a specific farm game, say Farmville, Taonga or Funky Bay, I’ll be giving you some general tips that you can apply to whichever farm game you’re currently playing as long as the points I’ll be presenting is applicable in any way. Let’s get started then! This is the main point in this article largely because it concerns the crucial aspect of any farm game... the actual farming and crafting processes. There are many ways you can maximize your farm’s productivity to your best ability but it depends on the rules of the farm game you’re playing. 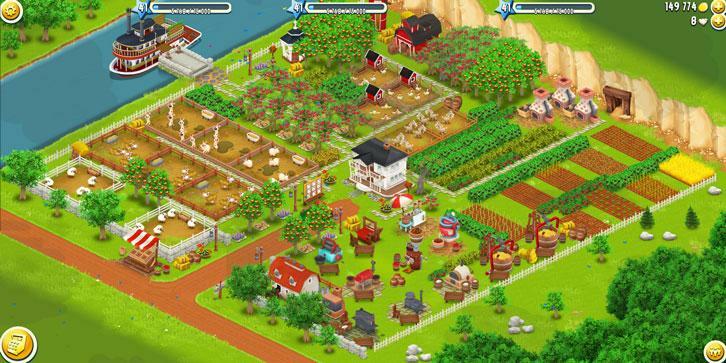 For instance, in Farmville, you are allowed to place as many farm plots as you can and this means you should do that just so you can maximize your crop production and in turn earn a ton more money than someone who is focusing more on the aesthetics of their farm. Obviously, if this is not possible, then you should at least have the maximum number of farm plots allowed on your farm, and make sure that they are always planted with one crop or the other. Another vital aspect of maximizing your farm’s productivity is by planning your crop rotations, your crafting and your workers (if there are any). This is especially true if your crops can wither in the game and you definitely wouldn’t want that since it’ll mean wasting cash on buying the seeds/ your stock of seeds and the time you’ve spent waiting for your crops to get “over-mature”. So, take some time to do some simple math to make sure to plant a crop with a growing duration that coincide with the few minutes of free time that you can spare in your daily routine or schedule. The same goes for anything you craft or crafting processes that require workers to perform. Most farm games place a strong emphasis on their social aspect of the game which mainly includes neighbors as well as the many different benefits that comes along with it. By having a ton of active neighbors, you can exchange gifts with them, ask them for materials you need for a building on your farm or to unlock a new piece of land, trade with them, speed-up the growth of their crops with fertilizers, and more. However, most players surprisingly don’t really make full use of this feature and lose out on many of these advantages which are crucial to help them “win” in farm games. Thus, it’s wise for a virtual farmer who wants to be successful to devote a certain amount of time in looking for active neighbors. There are many ways you can do so, from posting ads asking for neighbors on the game’s official Facebook fan page to joining game groups where players are more coordinated in terms of helping each other out. Adding new neighbors shouldn’t be too much of a worry for you either since most farm games, especially the newer ones, now have this amazing feature where the neighbors you add in the game don’t have to be added to your Facebook friends’ list and hence, you can still retain your privacy while having an army of dedicated neighbors who will always have your back. You should also know that you must return the favor when it comes to back-scratching. If they send you a gift, do not just accept it without sending one in return. This is just the sort of common, unspoken courtesy that virtual farmers have, and if you were unaware of it, you sure do now. And if you want to go a step further in becoming a great neighbor, keep sending gifts (the games usually let you send one gift per person per day) even if your neighbors, who usually return the gifts you sent them with gifts of their own, have not send any back in return. Sometimes, players took a few days or a week off to go on a trip and they may be very appreciative of you when they realize that you’ve kept sending them gifts even though they haven’t had the opportunity to send one back when they came back. That said, you should also do some “spring cleaning” of your list of neighbors every now and then to remove the ones who are not active and not contributing to the growth of your farm in any way. It’s a bit brutal to do so, to be honest, but if you are to win, you need active, long-term neighbors... and that’s that. There is just no way around it. ... and that concludes the first part of our How to “Win” in Farm Games article series. Check back in for the second part and learn how you can be a successful virtual farmer!